Presenting the idea of artificial intelligence as a considerable form of self-aware life, as a sentient and evolving creation both different and similar to that of humans, has proven to be a tricky endeavor for Hollywood. Typically, those philosophical ideas manifest better in text where they're given room to ruminate without the concerns of pacing or sustaining a visual language, which have been stumbling blocks for the likes of Alex Proyas and Wally Pfister. Writer/director Gabe Ibanez attempts to convincingly bring those science-fiction contemplations to the big-screen with Automata, a plausibly bleak rendition of the future where humans became reliant on obedient, non-threatening robots to complete our dangerous or demanding tasks ... and what happens when their programming gets tinkered with. It's an admirable effort with recognizable but intriguing sci-fi ideas rattling around in its can; however, its lethargic pace, washed-out setting, and awkward emotive streak keep it from being one of the strong Asimov-esque slices of cinema destined to eventually come. In 2044, the world has been rendered inhospitable due to encroaching solar flares, forcing the human population to persevere in radioactive conditions. To assist in the adaptation, the company ROC developed and produced robots, Pilgrims, that could handle the conditions, only they weren't entirely successful in keeping the threats at bay. As the years past and mankind settled into a weaker state of living, the robots transitioned to more mundane tasks -- difficult physical labor and household attendance -- in a commercial capacity, ever bound to two protocols (laws!) that force them to aid humanity and not personally alter their programming. When a Pilgrim does act up, ROC's insurance investigator Jacq Vaucan goes to the site and deciphers whether it's a result of faulty encoding or human error/fraud. When he's asked to investigate the termination of a robot that reportedly acted human and attempted to repair itself with stolen electronics, Jacq follows the leads to a "clocksmith" who might have discovered the key to overriding the protocols. Automata's central strength lies in its ability to create a credible setting for the film's events: a desolate, gray, demoralizing glimpse at a future reliant on artificial intelligence, with cities resembling a barren and less-colorful spin on Blade Runner's dystopian Los Angeles. The tone created is one of sustainable desperation despite being surrounded by technological advancement, as if the population continues to count down a clock to inevitability instead of thriving, hitting a complicated balance between the practical and inherently drab results of the near-apocalyptic scenario. Together with writers Igor Legarreta and Javier Sanchez Donate, director Ibanez sticks as close to hard science-fiction as they can in their creation of an environment where humans and robots commingle, setting up rules to their universe -- the Pilgrims' protocols and memory banks, protection of the walled-off cities, ROC's desire to keep the peace -- and timidly breaking and elaborating on them through an investigation reminiscent of film noir. The building blocks are here for a substantial science-fiction thriller with the sensibility of a novel from Isaac Asimov or Arthur C. Clarke. 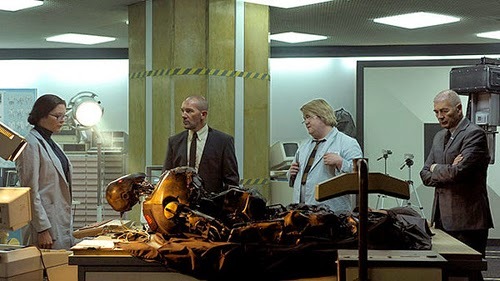 Despite Antonio Banderas' claims that it "tastes different", however, Automata doesn't do enough to innovate away from other contemporary films about synthetic life, reminding one of the developing intelligence concept from Transcendence and the defiant streak of I, Robot without establishing its own flavor. While the environment itself draws interest in the fate of both the Pilgrims and humankind on a wider scale, the mystery and the characters propelling the story forward lack the same verve. Director Ibanez mechanically navigates the theoretical concepts of robot prevalence in society and the technological singularity, attempting to be thorough with his incorporation of ideas without a grasp on how to add something fresh to the conversation, aside from a few musings on the parallels between birthing a child and programming a life into existence. Ideas about concealing truths from the public and the blunt, destructive nature of humans take the plot through twists and turns, but there's a dire lack of suspense or originality around every corner Jacq Vaucan takes both in and outside the city. Antonio Banderas musters obligatory glum brooding and sleuthing determination as a noir-ish insurance investigator in Automata, escalating as Vaucan digs deeper into the Pilgrim mystery and struggles with his wife's pregnancy. 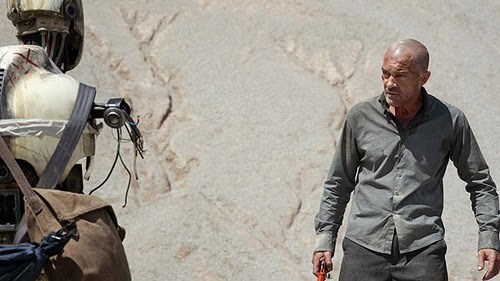 However, the actor's strengths get lost in the abrupt expressive demands placed on the character later on, forcing him into weepy and distraught mannerisms that fall flat in barren surroundings. He slowly becomes less and less convincing as someone involved with the subtleties of robotics, while also losing steam as a compelling protagonist as he's dragged kicking and screaming into the murky world of modified synthetic lives. Melanie Griffith doesn't really offer much either in a glorified cameo as Dr. Dupre, awkwardly miscast as a robotics expert who feebly delivers techno-babble in what seems like little more than stunt casting alongside (then-husband) Banderas. Dylan McDermott is unrecognizable but shrug-worthy as the thuggish cop who puts everything in motion, while character actor Robert Forster delivers a fine but forgettable authoritative performance as Vaucan's boss. Strangely, as if trying to offset the austere tempo preceding it, Automata eventually loads up an assertive emotional streak about sympathizing with robotic (co)existence and the demands on Jacq Vaucan's personal life, driving the film into exaggerated territory amid the search for the fabled clocksmith responsible for the technological divergence -- and Jack's relationship with Cleo, previously a love-bot with a female voice and face. Despite an uptick in inspired visual effects for the budget and a uniquely pulsating score from Zacarias M. de la Riva, this third act transforms into a overwrought mess, bolstered by mustache-twirling corporate practices and paternal trauma that overwrites many of its nuances. The murky demands of the story shove Vaucan into a situation where he has no choice but to recalibrate his philosophy behind synthetics as a valid form of life, and the conclusions he reaches in lethal conditions lack authentic catharsis. It's a shame, because there are some clever thoughts at director Ibanez's fingertips: to challenge the audience's perception of the creation of awareness and what differs human thought-processes from those of a computer. Here, it's a dull jumble of previously touched-on concepts that needs a more powerful bio-kernel to construct them.